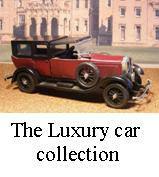 The Forty was introduced at the first post-WW1 Motor Show in London, in November 1919. 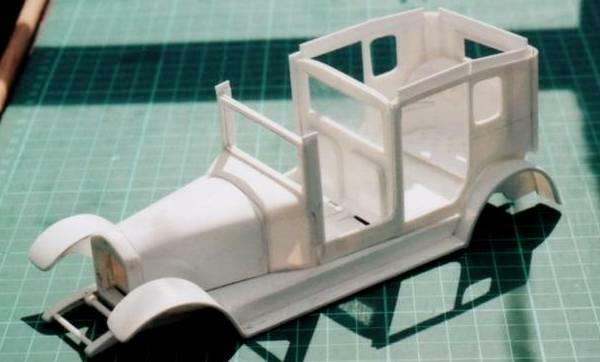 Although the chassis was somewhat similar to the short-lived 'Sporting Forty' of 1914-15, it was really an all new car. Advanced for it's day with an overhead camshaft for it's six-cylinder 6178cc engine, whch developed around 96hp, and having an epicyclic gearbox, although with a normal manual change. The designer was George Lanchester, one of the three brothers who had founded the company. With the arrival of this new model Lanchester, for a time, embarked on a 'one model' policy and firmly established itself in the luxury class. 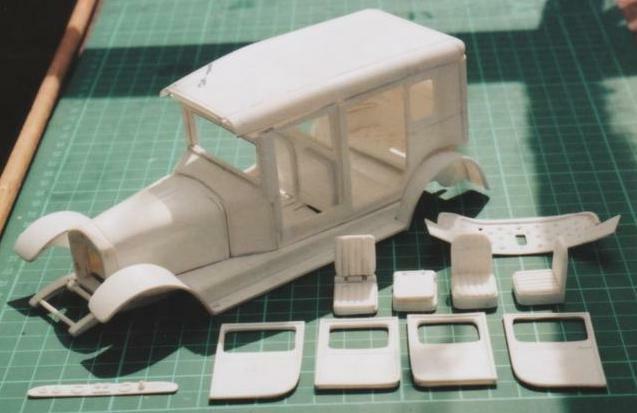 The Forty was a direct competitor for the Rolls-Royce Silver Ghost, and cost only slightly less for the chassis! It was a more modern car than the ageing 'Ghost' and with a top speed, in tourer form, of 80mph (129kph), it was a better performer. The Lanchester was further improved with front wheel brakes in 1924, a more powerful engine in 1925 and low pressure balloon tyres in 1926. Naturally, the big Lanchester attracted a select and wealthy clientele. 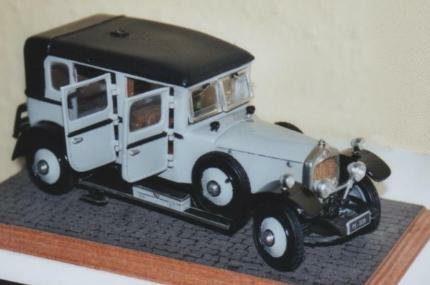 The subject of this model is the car of the most famous owner, HRH The Duke of York, later King George VI. in 1926 the Duke's first born infant daughter made her first motor car journey at the age of six weeks in her father's Lanchester, said infant is now our present Queen, Elizabeth II. Motor historians described the ‘Forty’ as a splendid old fashioned car; this misses the point as the only really old fashioned feature was its quality. There were few Edwardian engines of only 6¼ litres capable of propelling 2½ tons of lordly carriage at 78 mph. Several of these cars went to Indian potentates. 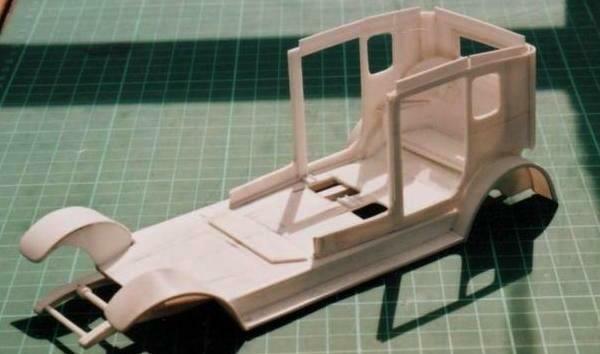 Totally scratchbuilt to a scale of 1/24 it was constructed in units; chassis, floorpan, saloon/drivers compartment and bonnet/radiator. 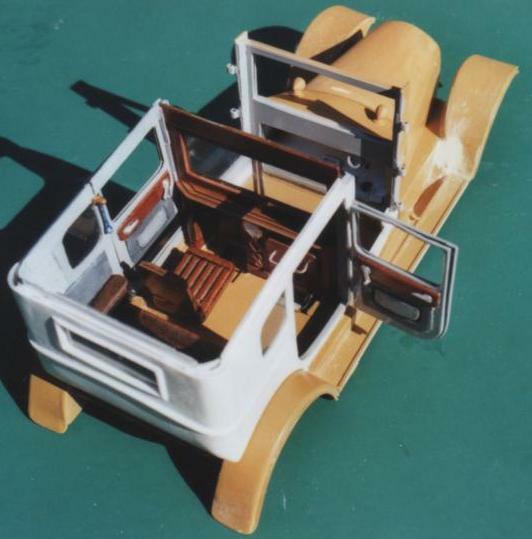 The latter two 2-part units are detachable to allow for cleaning the models interior. 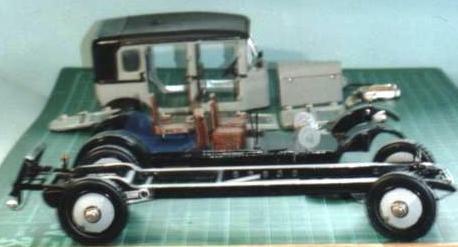 The Chassis, constructed from Box and Channel section with Rod & Tube cross members, is to a photo in a 1930’s repair manual. 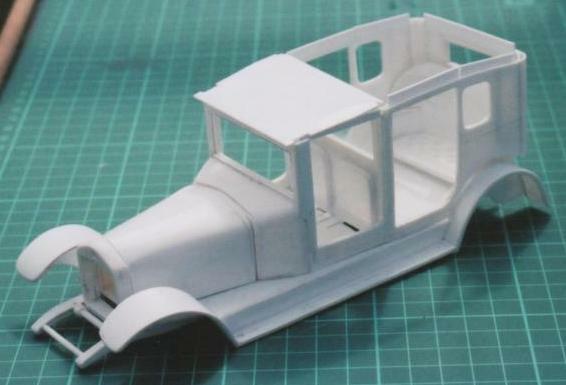 As far as I can ascertain the body was built ‘In house’ by Lanchester as was their custom. 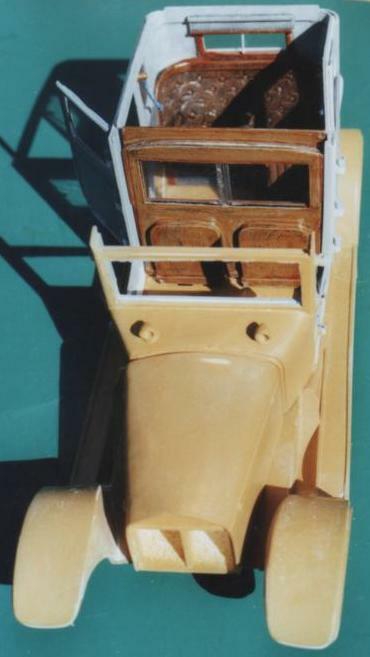 The body is double skinned on a frame similar to that actually used by Lanchester. The only available reference to the saloon interior was a 3-second sequence in a TV documentary about the Queens 80th Birthday Celebrations. So reference to other car interiors was used. The button leather upholstery is authentic though; the ‘Division’ carries a carriage clock flanked by recesses for the two fold-away occasional seats. Corded strap hangers are fitted to the ‘C’ posts and window winders, latch handles and ring pull door closers are fitted to all doors. There is a ‘Smokers Vent’ in the roof. 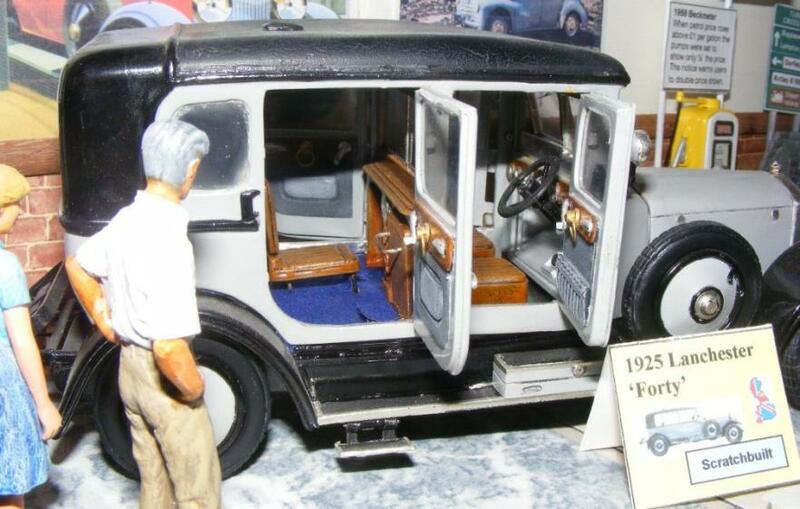 The driver’s compartment is as per reference to Lanchester ‘Forty’ Ser. No. 1679. The ‘Forty’ was one of the first models to depart from Lanchester’s traditional mid-engine designs but it retained the epicyclic gears but with the right handed change lever disguised to resemble a conventional gate and clutch system as on the model. Also retained and modelled are the traditional worm gear back axle and cantilever rear springs. The front wheel brakes appeared new for 1925. Many owners preferred not to display the marque’s badge on the radiator and considered the unique level gauge glass sufficiently distinctive, this car is one such. The front wing shape was difficult to reproduce and I resorted to using two small PVC bottles! One wheel, tyre and brake drum was scratchbuilt and the others moulded and cast in resin from it.